Yarn Type A beautiful, tweedy yarn with subtle kemps and coloured fibres that creates stunning aran hand knits with added interest. It comes in a blend of 74% acrylic, 20% wool and 6% viscose, making this yarn machine washable, and in a great value 400g ball. Leaflet with a design for a Sweater using Hayfield Bonus Aran Tweed. Leaflet with designs for Cardigans using Hayfield Bonus Aran Tweed. Leaflet with a design for a Jacket using Hayfield Bonus Aran Tweed. Leaflet with a design for a Cardigan using Hayfield Bonus Aran Tweed. 16 designs for children and adults knitted in Hayfield Bonus Aran & Bonus Aran Tweed. In this collection of 16 Favourite Aran Knits there are knits for all the family - pieces that have traditional aran stitches but in wonderfully modern Hayfield shades, and those with design twists that give a contemporary edge to the traditional aran knit. 12 Homeware designs knitted in Hayfield Bonus Aran and Bonus Aran Tweed. This collection of homewares has been designed in beautiful Hayfield Bonus Aran and Hayfield Bonus Aran Tweed yarns. When designing this collection of homewares Sirdar wanted to create pieces that would add texture, warmth and colour to your home that would not only look stunning but that would be comfortable and cosy too. In this book you will find generous throws, beautifully patterned cushion covers, cute patchwork teddies, cosy hot water bottles and country chic doggy shaped doorstops and draught excluders. 14 designs knitted in Hayfield Bonus Aran and Bonus Aran Tweed. In this latest book of Hayfield Aran knits Hayfield Bonus Aran and Hayfield Bonus Aran Tweed yarns have been used to create a collection of truly inspiring Aran designs for women. The designs in this collection include a flattering swing coat, cosy polo neck and wrap neck pieces, as well as cardies, waistcoats and sweaters with the most stunning cable designs. They are pieces that are incredibly easy to wear when on chilly week end walks, but that will leave you feeling cosy and warm and most importantly wonderful. 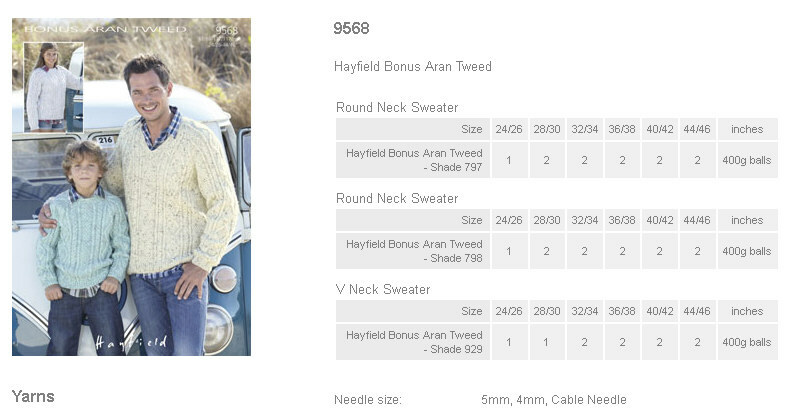 12 designs for men and women knitted in Hayfield Bonus Aran Tweed. This new collection has been inspired by outdoor living and we've created a collection of cosy Aran knits that will keep you warm throughout the winter months. There are classic cabled sweaters for women, as well as cowl-neck tunics and an amazing bobbled sweater. As well as cosy garments, there are two diamond cabled blankets perfect for snuggling up in front of a roaring fire. 14 aran cardigan and jacket designs for all the family using Sirdar Hayfield Bonus Aran Tweed. This book has designs in sizes from 4 years to adults. There are classic cardies for the girls and longer line jackets, some with hoods. Many of the designs have cables with easy textured stitches to keep them relatively quick to knit. There are also stunning cables and beautiful crafted trellis patterns which are so satisfying to make. 16 designs using Sirdar Hayfield Bonus Aran Tweed for all the family from 2 years to adult. 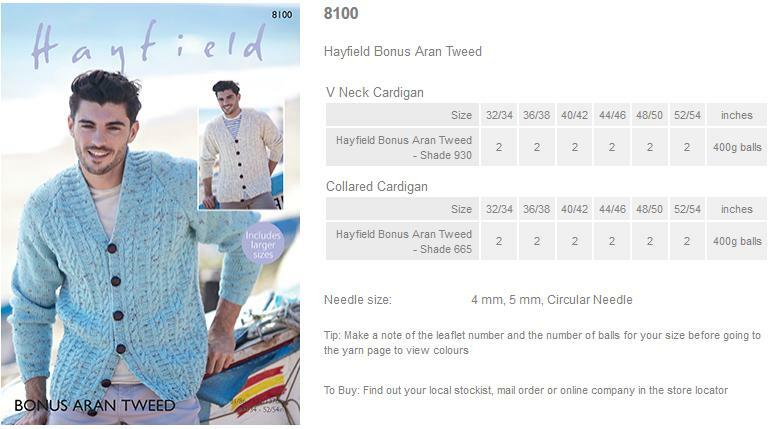 Leaflet with designs for V Neck and Collared Cardigans using Hayfield Bonus Aran Tweed. 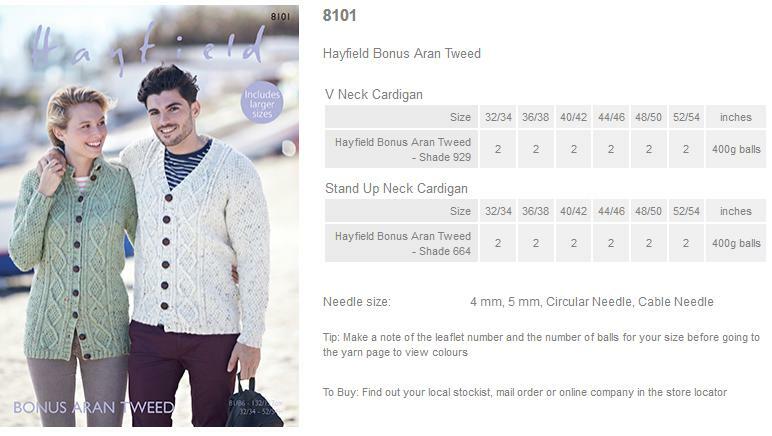 Leaflet with designs for V Neck and Stand Up Neck Cardigans using Hayfield Bonus Aran Tweed. Leaflet with designs for Round Neck and Flat Collared Cardigans using Hayfield Bonus Aran Tweed. 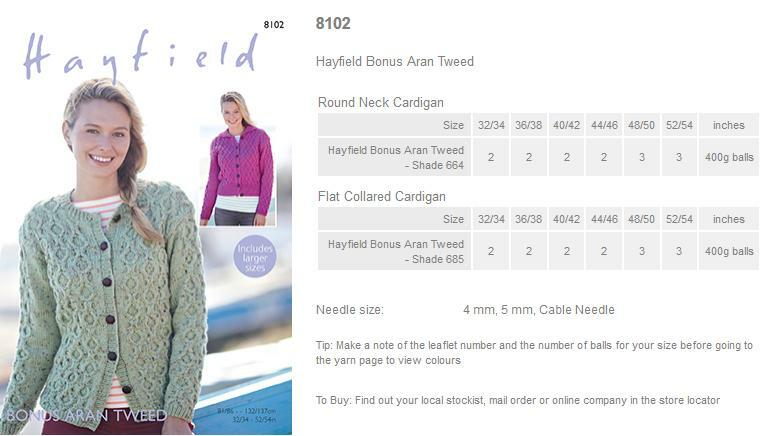 Leaflet with designs for a V Neck Cardigan and Cardigan With Collar using Hayfield Bonus Aran Tweed. 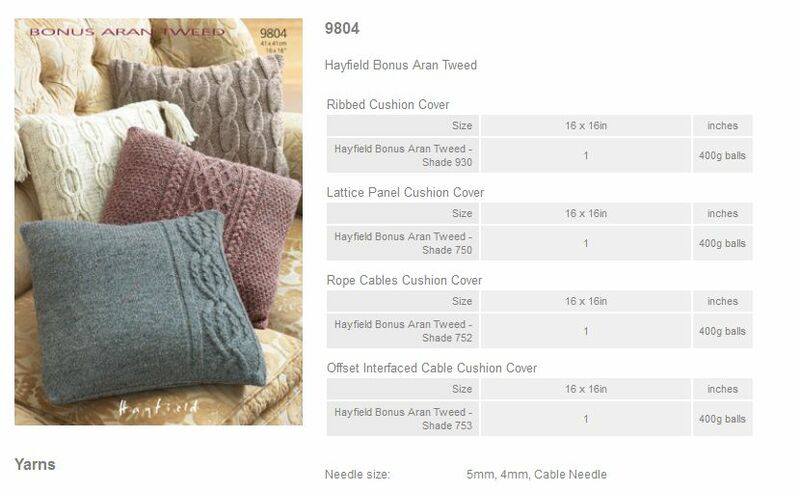 Leaflet with designs for Cushion Covers using Hayfield Bonus Aran Tweed. Leaflet with designs for a Round Neck Sweater, Wrap Neck Sweater and Hat using Hayfield Bonus Aran Tweed. 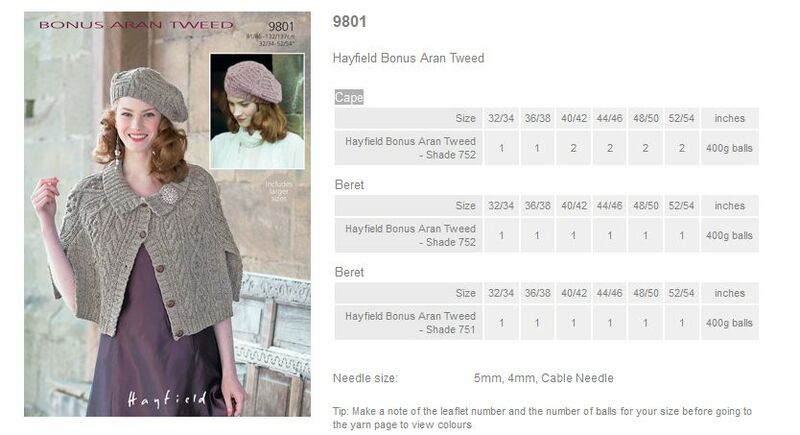 Leaflet with designs for a Cape and Berets using Hayfield Bonus Aran Tweed. 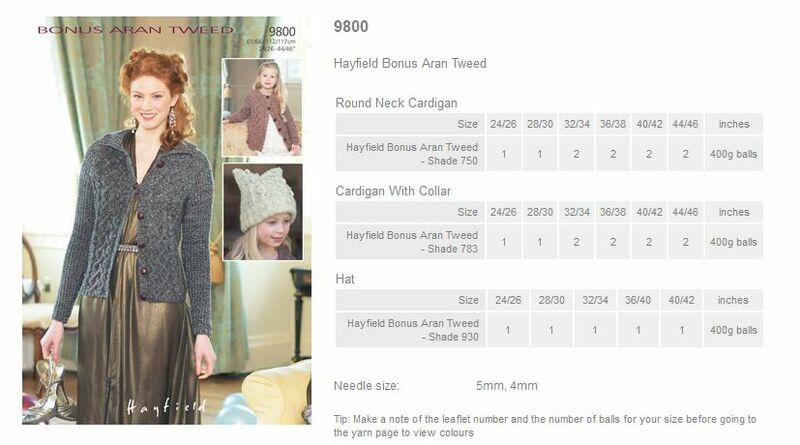 Leaflet with designs for a Round Neck Cardigan, Cardigan with Collar and Hat using Hayfield Bonus Aran Tweed. 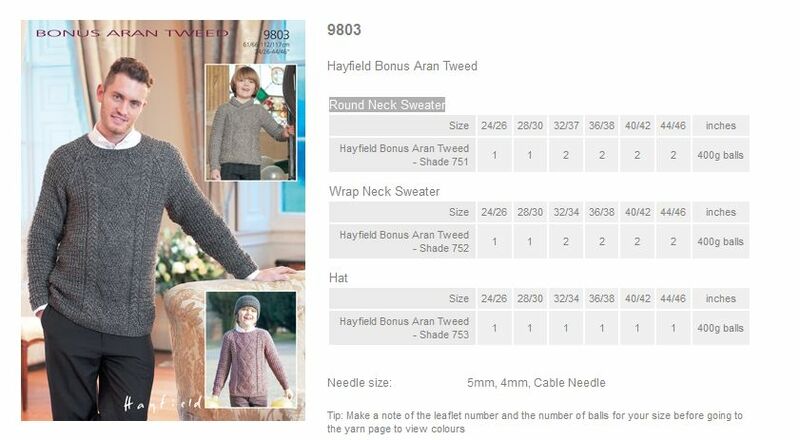 Leaflet with designs for V Neck and Round Neck Cardigans using Hayfield Bonus Aran Tweed. Leaflet with designs for a Round Neck Sweater and Sweater with Stand-up Neck using Hayfield Bonus Aran Tweed. 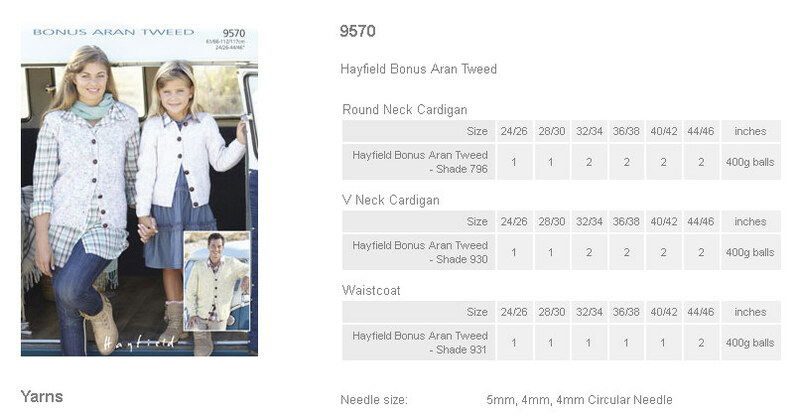 Leaflet with designs for a Round Neck Cardigan, V Neck Cardigan and Waistcoat using Hayfield Bonus Aran Tweed.